Circa 1901: Designed by virtuoso bank inventor Charles A. Bailey for Cromwell, Connecticut’s J. & E. Stevens Company, the Magician Bank is based on the timeless vanishing rabbit trick. 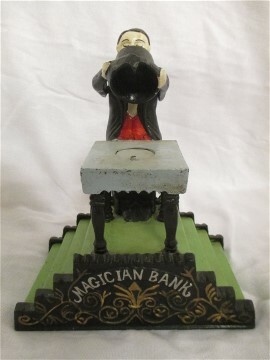 When one places a coin under the magician’s top hat and presses the lever, the hat covers the coin, and the coin “magically disappears,” sliding down a cleverly designed (and hard to detect) chute. 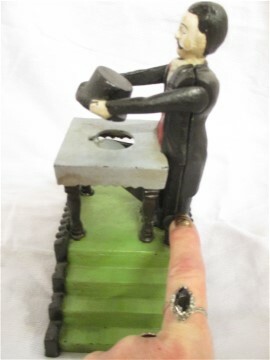 Upon the lever’s release, the magician raises his hat, revealing an empty table. This ingenious optical illusion was sure to delight its young turn of the century owners and help them save their change for that proverbial rainy day. 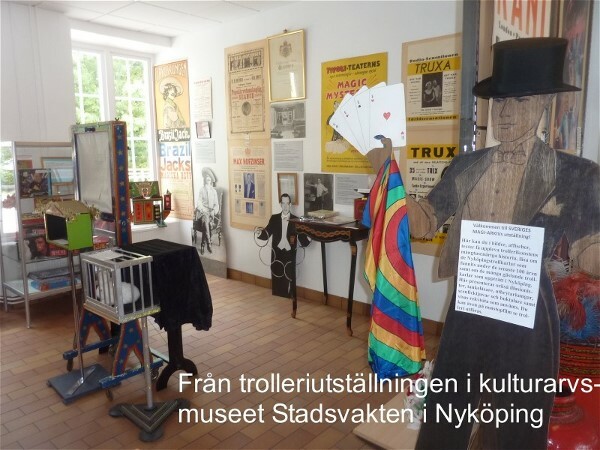 The highly desirable Magician Bank is difficult to find in any condition, and because it was not primed at the factory, most extant examples have heavy paint loss, especially to the figure’s face. This antique American cast iron bank displays an excellent face and colorful pink flocking on the stairs, works perfectly, and boasts no chips, cracks, or repairs. Moreover, its painted surface is completely original and untouched. We are sure this scarce and handsome mechanical bank will please its new owners just as it did over a century ago.